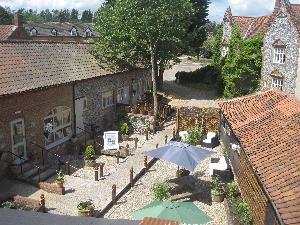 The Barns01263 833033work Bed & Breakfast'The Barns' at Thorpe Market is a charming brick and flint converted barn offering you the ideal base from which to explore beautiful North Norfolk. The pretty hamlet of Thorpe Market lies just a couple of miles inland from the coast, with Cromer to the north and the broads to the south, the Cathedral City of Norwich just 20 miles away. All of our exquisitely furbished en-suite rooms with their tea and coffee making facilities, plush beds, flat screen TV's, and Wi-Fi are set away from the main building surrounding a private courtyard. The guest lounge/breakfast room with its exposed brickwork and traditional flint walls, vaulted ceiling and beams, offers you a place to relax and look through the maps and guides before you go exploring. There is a separate Boot room, drying facilities and secured bike storage available for your use. We offer you a choice of breakfast using fresh local produce; packed lunches are available with prior notice. 'The Barns' at Thorpe Market is a charming brick and flint converted barn offering you the ideal base from which to explore beautiful North Norfolk. The pretty hamlet of Thorpe Market lies just a couple of miles inland from the coast, with Cromer to the north and the broads to the south, the Cathedral City of Norwich just 20 miles away. Access statement is available to view on website, or please call and we can email or post you a copy. Bird Watching, Biking and Beach Running - we can arrange these activities for you, All subject to avaliability. Property lies within the quiet lane scheme, perfect location for Cromer, Norwich and The Broads, Bittern Line railway1 mile, 3 18- hole golf courses within 9 miles, Within 1 mile of National Cycle Network route 30. Children welcome from age 14. The entrance is clearly marked by our sign.